Dr. Woods Hutchinson in McClure’s magazine, 1906. In the mass conversion towards refined and processed foods that has swept much of the world over the past few generations, many foods normally occurring in a wide variety of earth tones, became white, as if a formidable fairness cream had descended upon the food industry. White flour, white sugar, white bread, white spaghetti, white rice, white upma ravva, white urad dal occupied the markets. At first a status symbol for those who could afford them, refined foods later became a status symbol for those who need not eat the coarser grains because they lived a delicate life and could hire workers to do their heavy lifting for them. Eventually they themselves became cheaper than their whole grain counterparts, while the nutritious polish and peels were diverted to the livestock industry. Thirty years ago, Sidney Mintz unpacked the social, economic and political context of food in his seminal work, Sweetness and Power. The history of whiteness and power with respect to food offers much to explore. While evolutionary biology may account for our predilection towards the quick calories that processed foods offer, taste and food habits evolve under a variety of influences and cultural messages. Work well and bread will grow! Matters of taste and food habits are wrapped up in social and political dynamics. Consider the Russian black bread (черный хлеб or chor-nee klebph), of which equally fervent social statements have been made. 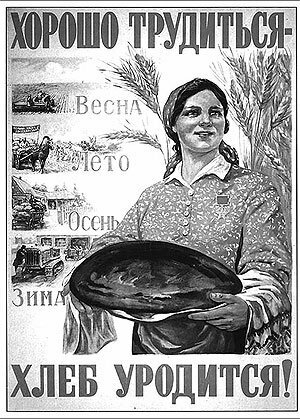 On this Soviet poster proclaiming “work well and bread will grow!” the bread that the woman proudly displays is black, its color coming from the rye as well as the molasses that went into it. High-fiber, dark-colored foods have been associated with working class diets and how one evaluates the color and texture of food is related to one’s attitudes towards work, particularly physical work. Chocolate and coffee are associated with leisure and luxury for those who eat them — though of course it is another story entirely for those who grow and harvest the beans that go into them. This any number of other examples that complicate the color correlation of food, class and social status would make for an interesting though at times heartbreaking and potentially infuriating study of food culture and politics. “No race ever yet ate black bread when it could get white; nor even brown, yellow, or other mulatto tint.” Dr. Woods Hutchinson in McClure’s magazine, 1906. Or is it, that as in essence whiteness is not so much a color as the visible absence of color; and at the same time the concrete of all colors; is it for these reasons that there is such a dumb blankness, full of meaning, in a wide landscape of snows- a colorless, all-color of atheism from which we shrink? I do not know if coffee and sugar are essential to the happiness of Europe, but I know well that these two products have accounted for the unhappiness of two great regions of the world: America has been depopulated so as to have land on which to plant them; Africa has been depopulated so as to have the people to cultivate them.